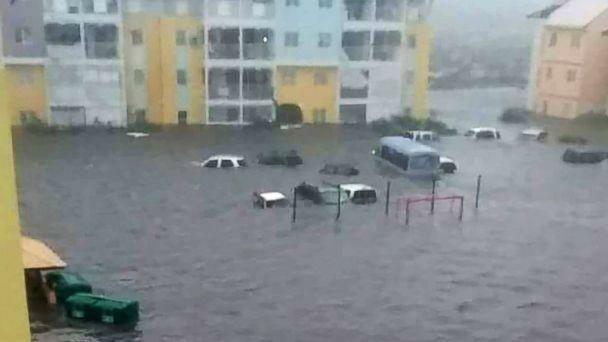 Hurricane Irma lashed the Caribbean today, causing at least 10 deaths, while in the U.S., Florida, Georgia and South Carolina are facing states of emergency as residents brace for the monster storm. The storm -- called "extremely dangerous" by the National Hurricane Center (NHC) -- currently has sustained winds of 180 mph and even higher gusts. In St. Martin and St. Barthelemy, at least eight people died and 21 were injured, according to the French Interior Minister. 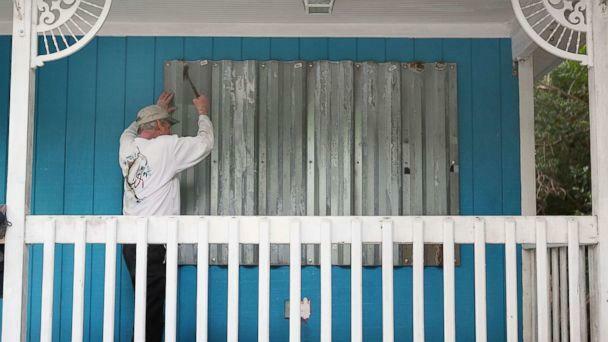 Another person died in Anguilla, according to the Director of Disaster Management. Aerial footage from Barbuda showed widespread devastation on the island. Gaston Browne, Prime Minister of Antigua and Barbuda, described the damage on Barbuda as "unprecedented" and called the island "barely habitable." As of 2 a.m. ET on Thursday, Irma was about 140 miles north-northwest of San Juan, Puerto Rico and moving west-northwest at about 16 mph. The hurricane is forecast to move north of U.S. territory this evening, unleashing strong winds and heavy rain. 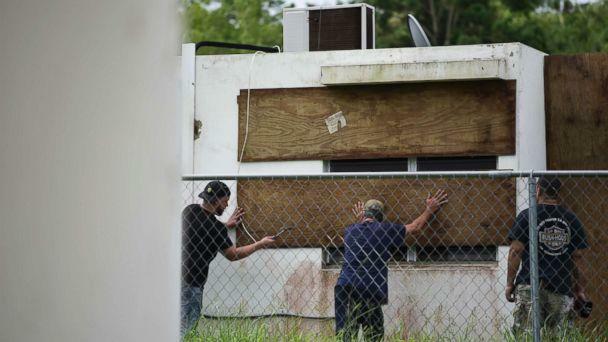 The Puerto Rican Electrical Energy Authority said about 950,000 customers were without power as of 9 p.m. ET Wednesday. The highest recorded wind gust in San Juan was 63 mph, but persistent heavy rain from Irma is expected to continue for hours and flash flood warnings have been issued across northeastern Puerto Rico, including San Juan. Flash flooding was occurring in Puerto Rico as of 8 p.m.
Turks and Caicos is the next major area of concern, with potentially catastrophic impacts Thursday evening. The storm will gradually begin to weaken as it crosses through the Caribbean, but it will still remain a powerful Category 5 storm through Friday, forecasters predict. 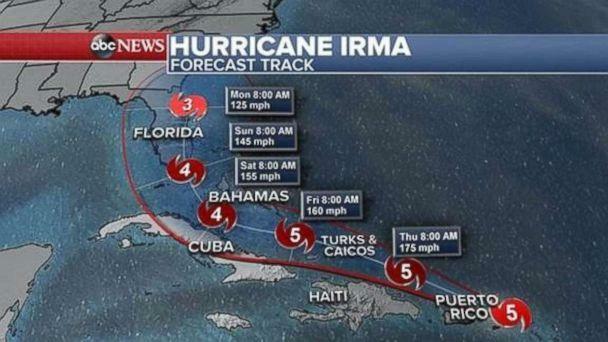 Irma's projected path goes through the Bahamas Friday into Saturday morning and the storm is expected to curve north toward Florida by late Saturday afternoon. On Sunday morning, Irma is expected to approach just south of Miami as a Category 4 hurricane with winds of 145 mph. Forecasts show Irma weakening to a Category 3 hurricane near Daytona Beach on Monday morning as it creeps up the east coast. 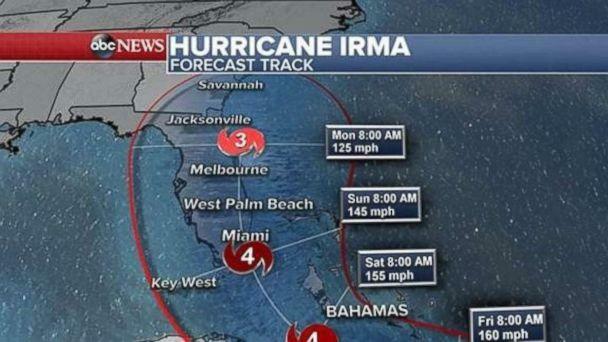 The storm is expected to then move up the Florida coast as a Category 3 hurricane with winds of 125 mph. Georgia and South Carolina are in the northern edge of the forecast cone as well. 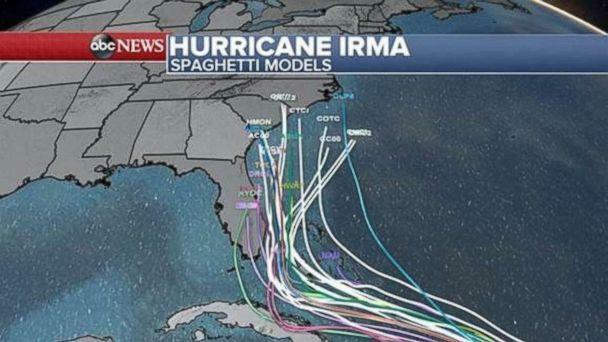 The current spaghetti models show Irma taking an eastern shift, which could mean a possible landfall on the coasts of Georgia and South Carolina. Some spaghetti models show the storm moving even further away from Florida's east coast. 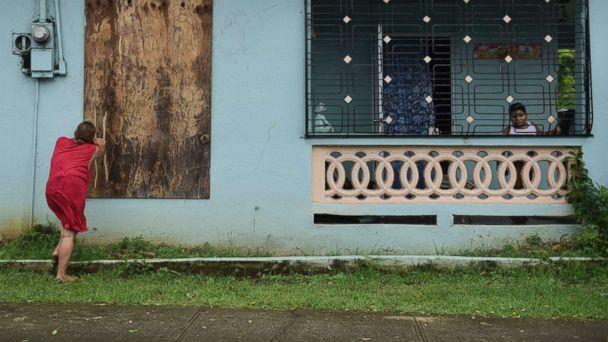 Today, as the rain pummels Puerto Rico, some tourists and residents are stranded. Rows of shops are boarded up today in one San Juan neighborhood as heavy wind and rain batters the area. The streets are deserted, with just a few scattered cars on the road. Puerto Rico Governor Ricardo Rossello warned of Irma's destructive and told the public, "There is no reason to be outside." Officials said over 1,000 people are in shelters. 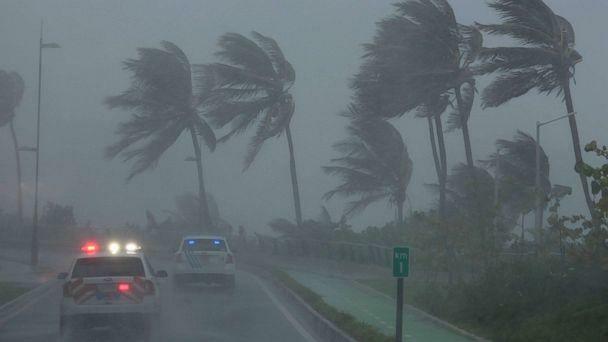 Two visitors to Puerto Rico who were holed up on the sixth floor of a villa told ABC News that the howling winds sound like a freight train going through a building. They said the rains and waves are so powerful that water is coming through windows and flooding their room. 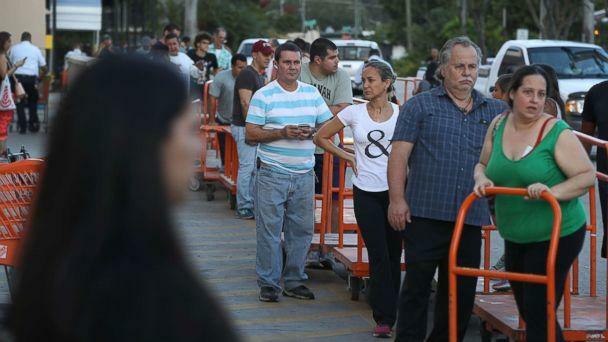 A shopkeeper in Old San Juan told ABC News on Tuesday that his shelves were mostly full, and to him, it didn't seem as if all locals appeared to be taking the storm very seriously. Preparations are already underway in Florida, which could face "direct impacts," according to the NHC, though it's too soon to tell for sure. Florida Gov. Rick Scott -- who declared a statewide state of emergency on Monday -- said this afternoon about 25,000 people have already evacuated. Hundreds of thousands of Floridians have been ordered to evacuate: Mandatory evacuations have already been ordered for Monroe County, which includes the Florida Keys, and coastal parts of Broward County and Miami-Dade County. And in Palm Beach County, the Town of Palm Beach Wednesday night issued a voluntary evacuation order for the Island of Palm Beach, which includes President Trump's Mar-a-Lago resort. The status of Mar-a-Lago is unknown. "After consultation with Palm Beach County officials, the Town is strongly urging a voluntary evacuation of the Island in advance of a mandatory order which may come at some point tomorrow," read a statement from the Town of Palm Beach. "Residents do not have to travel hundreds of miles but should seek shelter in a hotel on the mainland or hunker down with friends west of US-1. Tolls on the Florida Turnpike have been suspended to expedite traffic movement." Many residents of the Keys -- which the governor said is expected to be affected on Sunday -- didn't wait until today's mandatory evacuation and instead evacuated Tuesday. The Keys' famous tourist street, Duval Street, was nearly empty today. One Keys apartment building owner told ABC News she thinks the devastation left behind in the Houston area by Hurricane Harvey is on people's minds. She said nearly all of her tenants have evacuated, and she's encouraging them to do so, explaining that "this storm is different." Some Keys residents told ABC News they are preparing to stay, but they aren't ruling out evacuating if necessary. They say they are monitoring the forecast and will make a decision Thursday or Friday. On Wednesday evening, Miami-Dade County Mayor Carlos Gimenez declared mandatory evacuations in the county's barrier islands, including Miami Beach, Coconut Grove and much of Coral Gables. On "Good Morning America" today, Scott warned that Irma could be worse than Hurricane Andrew, which devastated the Sunshine State 25 years ago. Scott also said the state needs more volunteers, estimating the need for 17,000 volunteers state-wide. 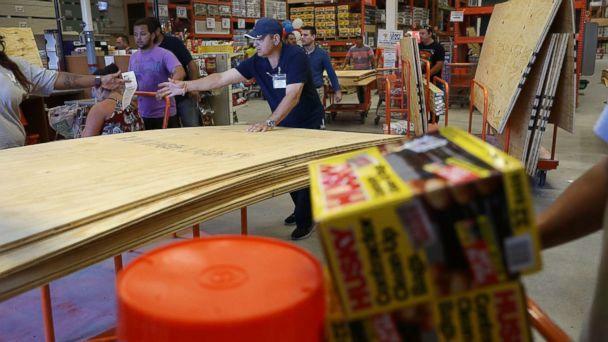 Florida Attorney General Pam Bondi announced concerns about price gouging in the state as residents prepare for the storm. Bondi's office has processed more than 500 complaints of price gouging and still has more than 1,000 complaints to go, she said. Most of the complaints are coming from South Florida and are having to do with the prices of food, water and ice, Bondi said. The attorney general said the state's residents are particularly susceptible to price gouging because of its large senior population. Scott urged people to be prepared but to also take only what they will need. "Three days of water per person, three days of food," he said. "Take enough but take only what you need, don't take more." 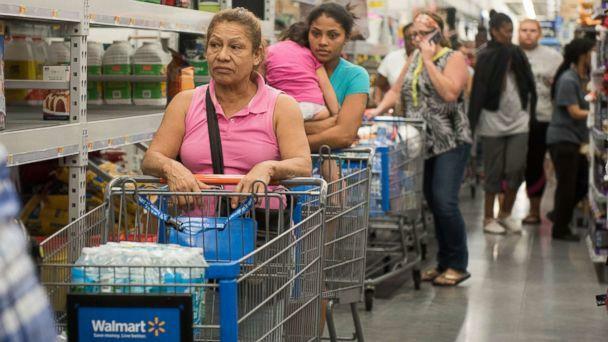 ABC News was at a Miami megastore where people were lined up for hours hoping to get water. Even after store officials came outside to say there was no more water, the line continued to grow. Another nearby store opened at 6 a.m. today, and by 6:08 a.m., the water was sold out. Long lines are forming all over Florida for gas, and in Miami and West Palm Beach, more than 25 percent of gas stations are out, according to GasBuddy. The Florida governor's office said the state is moving as much fuel through the system as fast as possible and is prepared to survey and coordinate fuel supply and resupply along evacuation routes. The state said emergency fuel contractors have secured 1.5 million gallons of fuel for initial delivery and confirmed that additional fuel supply is on standby for future deliveries. In Georgia, states of emergency have been declared for six coastal counties, as Gov. Nathan Deal in a statement urged "Georgians in the affected counties to remain vigilant and be prepared." Jose, another storm following behind Irma on a similar path, was upgraded today from a tropical storm to a hurricane. With 75 mph winds, the Category 1 storm could be near major hurricane strength on Friday. No watches or warnings are currently in effect, though residents of the Leeward Islands should monitor the storm. Hurricane Katia is currently forming in the southwestern Gulf of Mexico, according to the National Hurricane Center. As of 5 p.m., it was moving southeast at 3 mph and has maximum sustained winds of 75 mph. 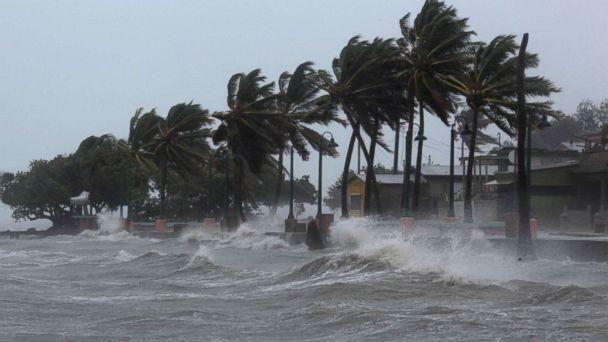 The Mexican government has issued a hurricane watch for the coast in the state of Veracruz from Tuxpan to Laguna Verde, according to the NHC. Browne is looking to evacuate the entire island of Barbuda -- about 1,600 residents -- in the event that another hurricane strikes. ABC News' Max Golembo, Linzie Janis, Gio Benitez, Melissa Griffin, Josh Hoyos, Sam Wnek and Ben Stein contributed to this report. Editor’s note: This story has been updated to reflect that Hurricane Irma did not make landfall on Barbuda.